The share of knowledge-intensive services and products in total output and demand and in the production of advanced, but also less advanced or emerging economies, has steadily increased over time and especially so for the knowledge-intensive services. This ‘quaternization’ of the economies not only points towards the rising shares of services but also stresses the role of knowledge-intensive services and their growing importance as sources of innovation and technology and as inputs into the manufacturing process. First the study documents the important role played by services in the EU as compared to the USA and Japan. Special emphasis is given to the role of knowledge-intensive business services (KIBS). The study then stresses the role of service output of manufacturing firms, a phenomenon also termed ‘convergence process’ which so far has not received much attention in the existing literature. Further it analyses the role of knowledge-intensive business services (KIBS) with respect to their role of embodied knowledge flows and linkages between KIBS and manufacturing sectors, underpinning that services have been playing an increasing role in boosting the productivity of manufacturing sectors. 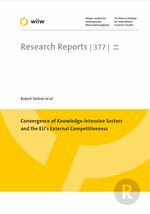 Finally, the study focuses on the importance of trade in knowledge-intensive manufacturing and services (overall and KIBS in particular) regarding the competitiveness of the EU with respect to trade in services in general and trade in knowledge-intensive business services in particular.